This is a simple side. It’s a bit more exciting than your usual rice or plain quinoa. While the dried fruit adds a little pop of flavor, it doesn’t make the dish overwhelming sweet, just a subtle, chewy fruit flavor. Turmeric is a lovely spice, so bright and cheery. It’s also supposed to be good for your joints, so if you suffer from knee pain or any other joint discomfort, try sneaking in some extra turmeric to your diet and see if you notice a difference (then report back!). In a medium saucepan, combine the quinoa, apricots, broth and turmeric, and bring to a boil. Reduce heat and allow to simmer until all the liquid has been absorbed, about 20 minutes. 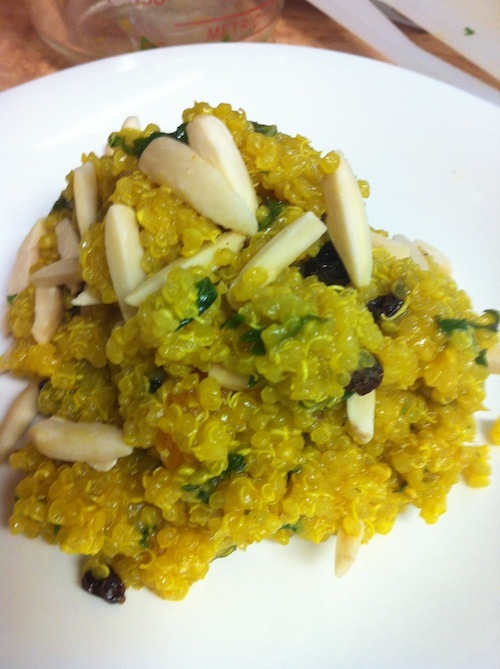 While the quinoa is cooking, combine oil, lemon juice, orange zest and mint in a bowl and whisk together. Season with salt and pepper to taste. When the quinoa is done, toss with the dressing. Mix in the currants and top with toasted almonds.